I was younger than 10 when a teacher told me that there were people who learn how to analyse people and their personalities simply by reading their handwriting. A trained graphologist can reveal many things about someone, from their personality to health issues. I was pretty impressed! Yet, it took me more than 10 years to look into it! First thing I did was an online handwriting analysis. My letters slope ‘forward’, which indicates that I’m self-controlled. Connected letters indicate extraversion. Not so sure about that one. No spaces between the words: impatience and confidence. And so on. In order to set up such a test, hundreds of people’s personalities and handwritings would have been looked at to match a specific handwriting characteristic with a personality trait. Debatable though whether statistics can then actually reliably account for someone’s being. It’s similar to analysing doodles or even body language. In the end of the day, we all act ourselves out in different ways, whether meaningful or not. Yet, interesting stuff! 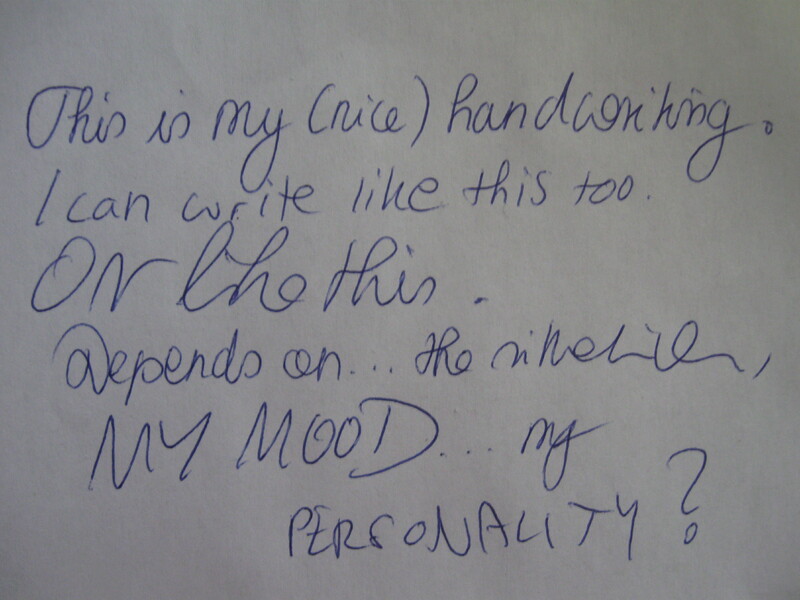 This entry was posted on 03/09/2012 by G in Academia, Favourite posts, Miscellaneous, Psychological Issues and tagged analyising, graphology, handwriting, personality.